Are you under the impression that new lubricants are clean? Many people are. While most manufacturers claim to make quality products, not every manufacturing process is of the highest quality. It is these processes or lack thereof that are at least partially responsible for the poor cleanliness of new lubricants. 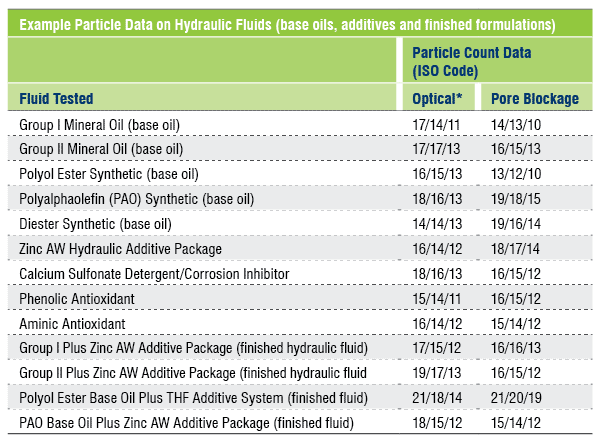 The table below shows an example of particle count data for hydraulic fluids. The process of making lubricants starts with the base oil. Additives are then added in the necessary concentrations to achieve the finished lubricant. Once blending is completed, the lubricant is tested to ensure the performance characteristics match those of the intended formulation. If they do not, a correction is developed, and either base oils or additives are used to bring the lubricant within the required specifications. Lubricant components are mixed together in a couple of different ways. Some manufacturers utilize what is basically a large, slow-speed blender, while others employ air to agitate the mixture. Even if the lubricant blender uses quality base stocks and additives, you must consider how these components are added to the blending vessel. Are the base stocks and additives filtered going into the blending vessel? Are adequate breathers installed? As with any tank, air is forced out when the tank is filled and drawn in when the tank is pumped out. If the air is not filtered, it will bring contaminants with it, which can affect subsequent blends. As the finished lubricants are moved from the blending vessel to storage tanks, they should be filtered to remove any contaminants. The tanks used to store the lubricants should also have adequate breathers to provide protection from particles and moisture. Some tanks simply have a J-tube vent. 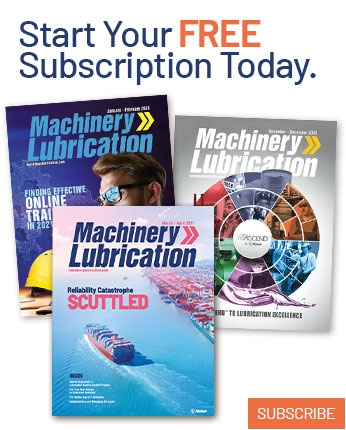 Find out whether your lubricant blender uses reconditioned drums or new drums and if there are specific cleanliness requirements for these drums. New drums are made in a metalworking environment with grinding and welding. The slag and grinding dust will end up inside the drums. In some cases, lubricant blenders just fill the drums without inspecting them for cleanliness. Even if the lubricant is packaged in buckets or bottles, there can be manufacturing debris in these containers. There is no universal standard for container cleanliness. In the case of bulk deliveries, lubricants should be filtered prior to being transferred into the tank. Also, research the manner used to clean the tank. Was it steam-cleaned or flushed with diesel fuel? Both of these methods can cause cleanliness or purity issues with the finished lubricants. Are the tanks dedicated to specific products to eliminate the possibility of cross-contamination? These are questions that you should ask your lubricant supplier. The illustration on the left provides an example of the typical process lubricants undergo before reaching customers. With grease manufacturing, the saponification process (soap thickener production) is more complex than simply blending base stocks and additives. If the temperature and timing are not controlled properly, the process is hampered, and the grease thickener quality can be affected. In some instances, the effects may be negligible, but in others, the entire batch will be ruined. While grease is “cooked,” the blending kettles should be kept closed to keep out contaminants. Also, be sure to inquire about the measures taken to prevent contaminants from entering the grease when it is being transferred from the kettle to the storage tank or the final packaging. Keep in mind that the drums used for grease are no cleaner than those used for oils if there aren’t specified cleanliness standards. Depending on the practices of the grease manufacturer, large batches of thickener are often made and kept in storage tanks for additives to be added at a later date. This raises some concerns, such as what protections are in place to keep airborne contaminants from entering the tank as the grease is pumped out. Are the transfer lines dedicated to a specific product? What are the pigging procedures used to mitigate cross-contamination? It is difficult, if not impossible, to filter grease at the high temperatures used in the manufacturing process. Although it is possible to pump grease through a strainer and remove some of the larger debris, this offers no real protection from the clearance-sized particles that damage your equipment. Of course, many lubricant manufacturers are diligent about the cleanliness of their final lubricants, including listing cleanliness levels on product data sheets. Some even have strict requirements for their distributors. If you have the opportunity, visit your blender’s plant and check out their processes. See if they are putting the same emphasis on keeping lubricants clean as they are on blending and formulation specifications. You may be surprised at the conditions in which the oils and greases you purchase are manufactured and transported. 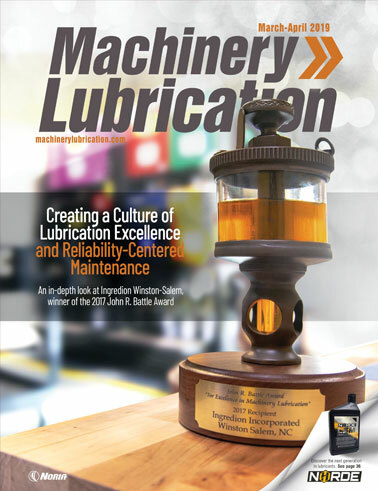 Once you are aware of how your lubricants are made and packaged, you should be even more diligent in ensuring that they are sampled and tested prior to being placed in your equipment.